Before moving to Atlanta, Meredith and Richard Vincent were content living in their 1,400-square-foot apartment in New York City. However, after the birth of their now 4 1/2-year-old twin boys, it didn’t take long for them to realize they would need more room. “I panicked about the lack of space and opportunities for the boys to run around and play, so having lived here briefly before, we made the decision to move back to Atlanta about two years ago, and it’s been a really good change,” says Meredith, an advertising executive. As they searched for a new home, the couple looked for something that combined the best of city and suburban life. “Coming from New York, we were excited to have a home and a yard, but we also wanted to be in town and close to a lot of activities,” Meredith says. After looking at several homes in Morningside, Virginia-Highland, Ansley Park and other nearby neighborhoods, they found what they wanted in Sherwood Forest: a 5,800-square-foot house constructed in 2011 that they purchased from the original homeowner in 2014. Although the home’s exterior is a fairly traditional brick and stone ranch with multiple gables, Meredith wanted a relaxed and livable interior conducive to the activities of two young boys while remaining chic, polished and well-designed. She enlisted the aid of John Ishmael, lead designer and owner of Nandina Home & Design in Inman Park. Together, they worked to create a home that took advantage of the high ceilings, big windows and open floor plan, resulting in a design aesthetic that made the most of the prevalent natural light. 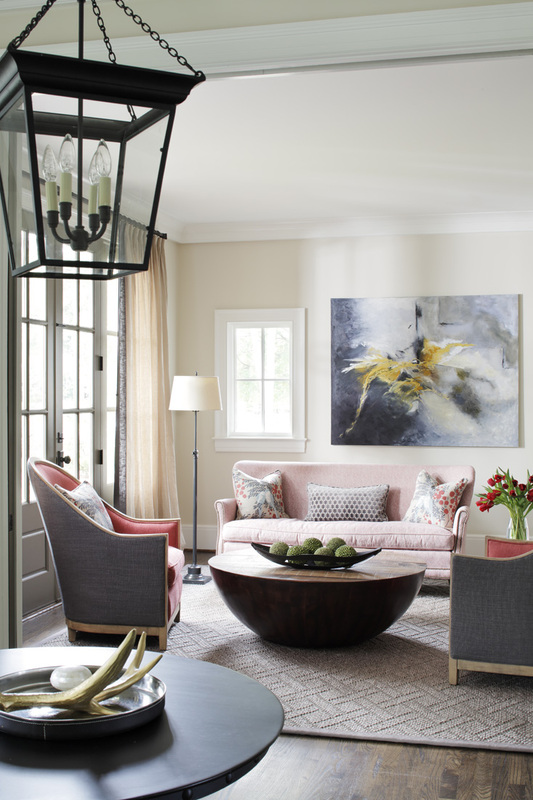 To accomplish this goal, Meredith chose a neutral yet light palette that was muted. As such, the home contains several shades of gray, white and off-white. For contrast, she decided to forego the more common white for all the interior doors, painting them Dovetail Grey from Sherwin-Williams instead. “[That] gives the home a unique look since the rest of the house is so light, white and airy,” she says. Likewise, Meredith opted for linen draperies to maximize the amount of natural light coming in through the windows. “It was important that it felt [open and well-lit],” she says. All the window treatments were produced by Nandina’s workroom using fabrics from Trend and JF Fabrics. Purchased by the original homeowner, the various light fixtures, which are minimalist in design and appearance, further added to the spacious feel of each room. When it came to furnishing the entire house, Meredith admits to having been overwhelmed, and she relied heavily on Ishmael to keep her from making “rash” decisions. “I wanted someone to make sure everything tied together without looking like I bought it all from one place,” she says. Coral upholstery adds a soft touch to the library. Also, selecting pieces that fit the size and scale of the house proved to be more difficult than Meredith anticipated. “Frankly, I think the biggest challenge in moving from New York to a big house with high ceilings was picking furniture that had the right scale for the home,” she says. For instance, in the living room, she flanked the fireplace with 7.5-foot tall bookcases. She filled the space with two sofas, two side chairs and side tables with oversized lamps. Along with furnishings, the couple were challenged to choose upholstery fabrics that could withstand the daily drubbing by two young boys. “They spill a lot of stuff and have greasy fingers,” Meredith says. “So it needed to look beautiful but also had to put up with a lot of wiping and washing.” She opted for a mix of prints and solids in various textures that are beautiful and durable. In each room, Meredith included artwork to add color and interest. Above the fireplace in the living room is an original oil painting by Ishmael, a self-trained artist who has been painting for 35 years, and the office features an original photograph by Atlanta photographer Troy Farina. The dining room contains a Pep Ventosa photograph purchased at the Lumas Gallery in New York City, one of the few pieces that transitioned from the couple’s apartment there. Muted colors create a relaxing environment in the master bedroom. Throughout the house, accessories also add visual appeal, color and texture. On the shelves by the fireplace in the living room are white horns and a collection of cream vases from Global Views, as well as a set of green vases from Cyan Design. A side table in the dining room is home to a striking rust-red vase from Global Views. “I like the visual interest of accessories, and I like being able to update a room with them,” Meredith says. Overall, Meredith is happy with the choice she and Richard made when moving to Atlanta. “This home is brighter than the others we saw,” she says. These well-known brands’ products are available at many online retailers: Wayfair.com sells Interlude Home, Cyan Design and Global Views products. Surya is available at Amazon.com and The Home Depot. Jaipur Living is available at Overstock.com. Dovetail Furniture is available from plumgoose.com. Lee Industries is available locally at Outrageous Interiors, which has four Atlanta area locations.